The Quinnipiac connection to the BCHL has gone back many years with many talented players in Bobcats history arriving by way of the Junior A league in Western Canada. Its no surprise that Quinnipiac continues to recruit out there for many of their players. 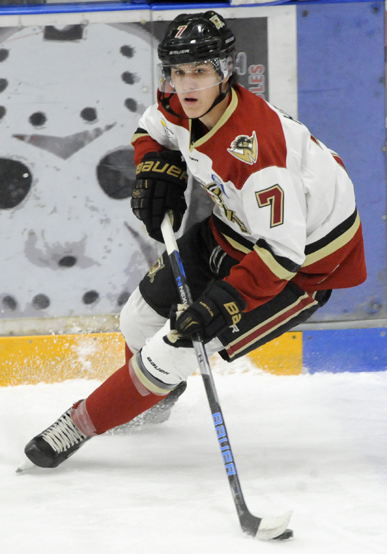 This past week the Bobcats picked up another commit out of the BCHL, this time in West Kelowna Warriors defenseman Wyatt Head. I had a chance to catch up with Wyatt for a Q&A on his recent commitment, his hockey development among other things. Thanks to Wyatt for taking the time out of his busy schedule to do this. @QHockeyBlog: First off congratulations. What are your emotions like after making this decision to announce your college commitment to Quinnipiac? Wyatt Head: Thank you. Obviously there’s a little stress off the back after a long time of working towards a college commitment to a great school. It is a lot of excitement in now knowing my future is set with a unbelievable program in Quinnipiac. @QHockeyBlog: When was the first time Quinnipiac reached out to you in order to let them know of their interest? Have they been on for you for awhile? Wyatt Head: I first talked to them early in this season at the BCHL showcase and talks continued after that. @QHockeyBlog: What other NCAA schools showed interest in you before you decided on Quinnipiac? Wyatt Head: I had talked to a hand full of schools early this season including UMass-Lowell, RIT, Bentley and a few others, but Quinnipiac had always been one of my favorite schools growing up so they immediately jumped out at me when talking with them. @QHockeyBlog: You mentioned that Quinnipiac has been one of your favorite schools growing up. Have you been following Quinnipiac hockey for a long time? Wyatt Head: I wouldn’t say a long time but since they’ve had those few real strong runs competing for the championship between 2013 and 2016. So I’ve definitely been following them for a few years. @QHockeyBlog: You played with current Quinnipiac Bobcat Michael Lombardi last season with West Kelowna. Did you consult with him prior to making the decision on committing to Quinnipiac? Wyatt Head: Yes for sure I talked to him about it. He told me how he was enjoying it and had lots of good things to say about the program. Just seeing the campus, facilities and talking with the coaches along with the winning culture they’ve created there made the decision to commit there one I felt very confident about. @QHockeyBlog: Your in your second full season with West Kelowna and after having 21 points a season ago in 58 games played you already have 11 points in 14 games? What type of things did you work on this past summer in order to improve your game in order to see increased offensive production from the blue line? Wyatt Head: Well I’m definitely trying to improve my strength and speed always which is a huge part of jumping up to college as well. I also did a lot of skill sessions such as power edge pro. @QHockeyBlog: Your expected to enroll for the 2019-2020 season. What are some of things you want to work on in your game prior to making the jump to the college game? Wyatt Head: I want to add some weight and get faster and stronger which is something you’ll hear from for a lot of guys making the jump to college. I’ll continue to develop my skills as well as there’s always a lot to work on. @QHockeyBlog: What would you consider so of your strengths right now as a player? Wyatt Head: I’d consider myself a very smart hockey player with a high hockey IQ and the ability to make plays. Offense is a big strength of mine for sure. @QHockeyBlog: Is there any player that you try to model your game after? Wyatt Head: A player I’ve grown to really like to watch is Drew Doughty. He plays with a lot of passion and always try’s to make something happen when he’s out there. Another player I try to model my game after would be Tyson Barrie from Colorado. I like his ability to make plays out there. @QHockeyBlog: To this point in your life who has been your biggest influence or role model to help you get this opportunity to play Division 1 NCAA hockey? Wyatt Head: I think the biggest influences so far in my life have been my parents. They both work extremely hard to give me opportunities to succeed. @QHockeyBlog: Tell us what type of person the Quinnipiac community will get in Wyatt Head on and off the ice? Wyatt Head: I believe they will get a hard working and passionate person. I also consider myself a very caring and selfless person. @QHockeyBlog: Off the ice what do you enjoy doing when you are not playing hockey? Wyatt Head: In the summer, I’m a big golf guy and also spend time with my friends and get out and do something. If there’s any opportunity to go hangout with my friends for the day or night I’m there. I’m a very social guy that loves to keep busy.